Eclipses usually come in pairs. In this eclipse sequence there are three of them, two solar and one lunar. This Full Moon in Aquarius is a total lunar eclipse and the second one in this sequence. Two weeks ago there was a partial solar eclipse in Cancer. Another partial solar eclipse will occur on Aug. 11, 2018, in Leo. This spectacular lunar eclipse will be visible in many parts of the world, at least partially. This is the longest total lunar eclipse of the century, because the Moon is passing through the center of the Earth’s shadow, and also because the Moon is near its apogee (the point of greatest distance) and thus moves slowly. Totality lasts 1 hour and 43 minutes, and the total duration of the eclipse is 6 hours, 14 minutes. Central lunar eclipses are the darkest ones and they are relatively rare. The previous one occurred seven years ago. During the total phase, the Moon will look reddish. If the sky is clear, the total phase should be visible in its entirety in southern Finland, where I live. What makes this eclipse astrologically really interesting is that the Moon will be in conjunction with retrograding Mars. 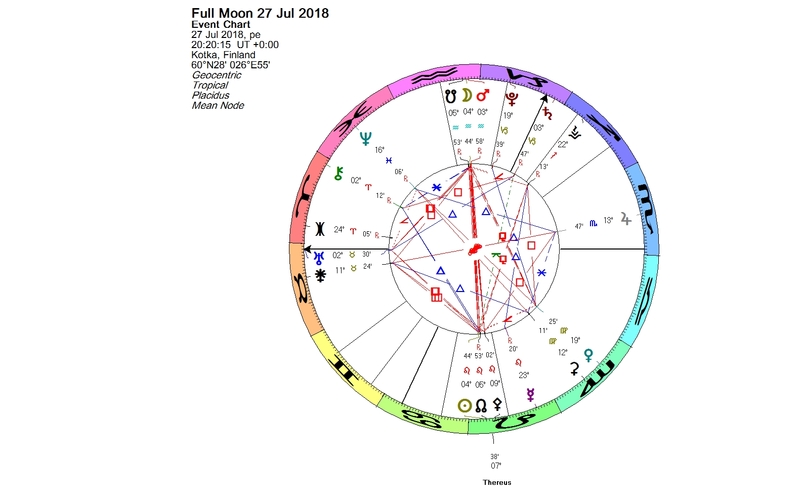 At the moment we are in the middle of the retrograde period of Mars (from June 26 to Aug. 27), and Mars reaches its opposition to the Sun on the day of the lunar eclipse. Now Mars is closer to Earth and shines brighter than usually in the sky. Also Mercury turned retrograde the day before the eclipse. Retrograding planets work a bit differently than planets in direct motion. It is possible that the usual expression of the planet gets inhibited. Normally Mars gives us courage, initiative, desire and other beneficial features, but also anger and aggression. In Aquarius this could come out as collective rage. Turning anger inwards is as undesirable as is uncontrollable rage. The Full Moon is always an opposition of the Sun and the Moon. All eclipses take place near the lunar nodes. In Leo, opposite the Moon and in conjunction with the Sun and the North node of the Moon is 32532 Thereus, a centaur planet with orbital period of over 34 years. This centaur can help us in dealing with Mars retrograde. In Greek mythology centaur Thereus was a hunter who captured bears and carried them home, alive and struggling. Why would anyone take a raging bear to their home? The myth doesn’t give us the answer, as there is nothing more told about Thereus. Ever since I read the tale of the crescent moon bear, I have in my imagination seen centaur Thereus in his home cave, having tea and a chat with an angry bear. 32532 Thereus, like all other centaur planets, has potential for healing. This entry was posted on Thursday, July 26th, 2018 at 11:41 pm	and is filed under Eclipses, Full Moon. You can follow any responses to this entry through the RSS 2.0 feed. You can leave a response, or trackback from your own site.